Nuclear factor-kappa B (NF-kappa B) is the generic name of a family of transcription factors that function as dimers and regulate genes involved in immunity, inflammation and cell survival. There are several pathways leading to NF-kappa B-activation. As shown in the following picture, the canonical pathway is induced by tumour necrosis factor-alpha (TNF-alpha), interleukin-1 (IL-1) or byproducts of bacterial and viral infections. This pathway relies on IKK- mediated IkappaB-alpha phosphorylation on Ser32 and 36, leading to its degradation, which allows the p50/p65 NF-kappa B dimer to enter the nucleus and activate gene transcription. Atypical pathways are IKK-independent and rely on phosphorylation of IkappaB-alpha on Tyr42 or on Ser residues in IkappaB-alpha PEST domain. 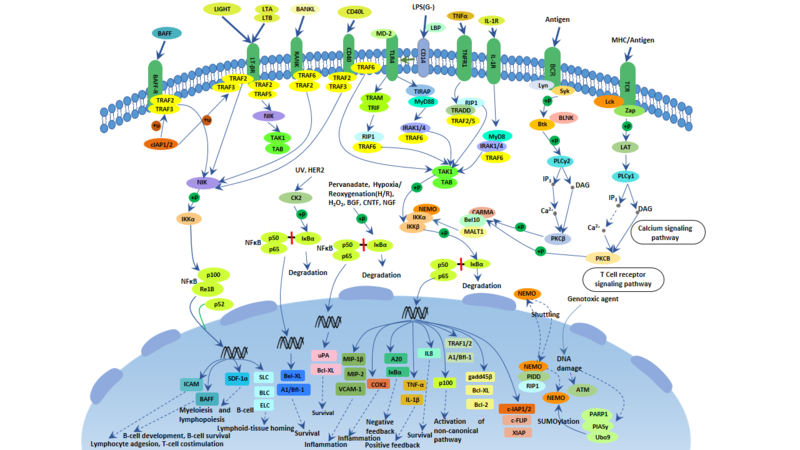 The non-canonical pathway is triggered by particular members of the TNFR superfamily, such as lymphotoxin-beta (LT-beta) or BAFF. It involves NIK and IKK-alpha-mediated p100 phosphorylation and processing to p52, resulting in nuclear translocation of p52/RelB heterodimers. All in all, Nuclear factor kappa B signaling plays an important role in inflammation and the immune and stress responses. Adaptor proteins recruit the IKK complex which phosphorylates and degrades IκB, allowing NF-κB to translocate to the nucleus. Dysregulation of NF-κB signaling can lead to inflammatory and autoimmune disease and cancer.